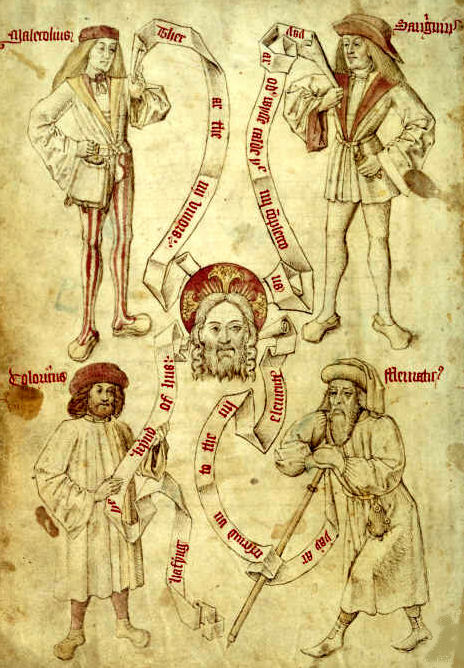 The Four Temperaments are the basic constitutional bodymind types of Greek Medicine. Each one is named after a certain humor, and is characterized by the predominance of that humor and its associated basic qualities. The Four Temperaments are the basic of all constitutional notions of diagnosis and treatment in Greek Medicine. Know your constitutional type and you know how to eat, live and medicate yourself properly for optimum health maintenance and disease prevention. Face: Oval or acorn-shaped face and head. Delicate, well-formed mouth and lips. Beautiful almond shaped eyes, often brown. An elegant, swanlike neck. Physique: In youth, balanced, neither too fat nor too thin. Moderate frame and build. Elegant, statuesque form, with ample, luxuriant flesh. Joints well-formed; bones, tendons, veins not prominent. Can put on weight past forty, mostly around hips, thighs, buttocks. Hair: Thick, luxuriant, wavy. Abundant facial and body hair in men. Skin: Pink, rosy, blushing complexion. Soft, creamy smooth luxurious feel. Pleasantly warm to the touch. Appetite: Quite hearty, often greater than digestive capacity. A predeliction for rich gourmet foods. The epicure. Digestion: Good to moderate; balanced. Can be overwhelmed by excessive food. Metabolism: Moderate, balanced. Bowel tone can be a bit lax. Digestive, respiratory, genitourinary mucosa can be problem areas. Predispositions: Metabolic excesses of the blood: uremia, gout, diabetes, high cholesterol. Intestinal sluggishness, putrefaction. Congested, sluggish liver and pancreas. Congested blood, bleeding disorders. Respiratory catarrh, congestion, asthma. Urinary conditions, genitourinary disorders. Excessive menstruation in women. Skin conditions, hypersensitivity, capillary congestion. Urine: Tends to be rich or bright yellow and thick. Stool: Well-formed, neither too hard nor too soft. Sleep: Moderate, balanced, sound. Can be some snoring. Dreams: Usually pleasant, of a charming, amusing, romantic nature. Travel, enjoyment, games, distractions. Mind: Faculty of Judgement well-developed. A synthetic intellect that likes to see the whole picture. An optimistic, positive mental outlook. Rather conventional and conformist; good social skills. Personality: Exuberant, enthusiastic, outgoing. Optimistic, confident, poised, graceful. Expansive, generous. Romantically inclined; loves beauty, aesthetics, the arts. Sensual, indulgent nature. Sociable, gregarious, lighthearted, cheerful. Face: Broad jaw. Sharp nose, high cheekbones. Sharp, angular facial features. Reddish face common. Sharp, fiery, brilliant, penetrating eyes. Physique: Compact, lean, wiry. Good muscle tone, definition. Prominent veins and tendons. Broad chest common. An active, sportive type. Weight gain usually in chest, arms, belly, upper body. Hair: Often curly. Can also be thin, fine. Balding common in men. Blonde or reddish hair common. Skin: Ruddy or reddish color if heat predominates; sallow or bright yellow if bile predominates. Rough and dry, quite warm. Appetite: Sharp and quick. Soon overcome by ravenous hunger. Fond of meat, fried foods, salty or spicy foods, alcohol, intense or stimulating taste sensations. Digestion: Sharp and quick. Tendency towards gastritis, hyperacidity, acid reflux. When balanced and healthy, can have a "cast iron stomach", able to digest anything. Metabolism: Strong, fast, active; catabolic dominant. Strong Innate Heat of metabolism. Liver and bile metabolism can be problematic. Digestive secretions strong, bowel transit time short. Adrenals, sympathetic nervous system dominant. Strong inflammatory reactions. Predispositions: Fevers, infections, inflammation. Hives, rashes, urticaria. Fatty liver, bilious conditions. Hyperacidity, acid reflux, inflammatory and ulcerative conditions of middle GI tract. Headaches, migraines, irritability. Eyestrain, red sore eyes. Purulent conditions. High cholesterol, cardiovascular disorders. Gingivitis. Bleeding disorders from excess heat, choler in the blood. Hypertension, stress disorders. Urine: Tends to be scanty, dark, thin. Can be hot or burning. Stool: Tends towards diarrhea, loose stools. Can have a yellowish color, foul odor. Sweat: Profuse, especially in summer, or with vigorous physical activity. Strong body odor. Sensitive to hot weather, suffers greatly in summer. Sleep: Often fitful, restless, disturbed, especially with stress, indigestion. Often tends to wake up early, or in the middle of the night. Dreams: Often of a military or violent nature. Dreams of fire, red things common. Fight or flight, confrontation. Mind: Bold, daring, original, imaginative, visionary. Ideation faculty well-developed. Brilliant intellect, sharp penetrating insight. The idea man who prefers to leave the details to others. Personality: Prone to anger, impatience, irritability; short temper. Bold, courageous, audacious; confrontive, contentious. Dramatic, bombastic manner; high powered personality. The rugged individualist and pioneer; thrives on challenge. The fearless leader. Seeks exhilaration, intense experiences. Driven, "Type A" personality. Prone to extremism, fanaticism. The Melancholic temperament tends to be the most problematic, since it's contrary to the Sanguine. However, with proper management, Melancholics can also be healthy. Face: Squarish or rectangular head and face. Prominent cheekbones, sunken hollow cheeks common. Small, beady eyes. Teeth can be prominent, crooked or loose. Thin lips. Physique: Tends to be thin, lean. Knobby, prominent bones and joints common. Prominent veins, sinews, tendons. Muscle tone good, but tends to be stiff, tight. Rib cage long and narrow, with ribs often prominent. Can gain weight in later years, mainly around midriff. Hair: Color dark, brunette. Thick and straight. Facial and body hair in men tends to be sparse. Skin: A dull yellow or darkish, swarthy complexion. Feels coarse, dry, leathery, cool. Callouses common. Appetite: Variable to poor. Varies, fluctuates according to mental/nervous/emotional state. Digestion: Variable to poor; irregular. Digestion also varies according to mental/nervous/emotional state. Colic, gas, distension, bloating common. Metabolism: Often slow. Can also be variable, erratic. Prone to dehydration. Nervous system consumes many nutrients, minerals. GI function variable, erratic; digestive secretions tend to be deficient. Blood tends to be thick. Nutritional deficiencies can cause a craving for sweets, starches. Thyroid tends to be challenged, stressed. Predispositions: Anorexia, poor appetite. Nervous, colicky digestive disorders. Constipation. Spleen disorders. Nutritional and mineral deficiencies, anemia. Blood sugar problems, hypoglycemia. Wasting, emaciation, dehydration. Poor circulation and immunity. Arthritis, rheumatism, neuromuscular disorders. Nervous and spasmodic afflictions. Dizziness, vertigo, ringing in ears. Nervousness, depression, anxiety, mood swings. Neurovegetative dystonia. Urine: Tends to be clear and thin. Stool: Can either be hard, dry, compact; or irregular, porous, club shaped. Constipation, irritable bowel common. Sweat: Generally scanty. Can be subtle, thin, furtive, indicating poor immunity. Nervous stress can increase sweating. Sleep: Difficulty falling asleep, insomnia. Stress, overwork, staying up late aggravates insomnia. Generally a light sleeper. Dreams: Generally dark, moody, somber, disturbing. Themes of grief, loss common. Mind: An analytical intellect; detail oriented. Efficient, realistic, pragmatic. Reflective, studious, philosophical. Retentive faculty of memory well-developed. Thinking can be too rigid, dogmatic. A prudent, cautious, pessimistic mental outlook. Personality: Practical, pragmatic, realistic. Efficient, reliable, dependable. A reflective, stoic, philosophical bent. Can be nervous, high strung. Frugal, austere; can be too attached to material possessions. Serious, averse to gambling, risk taking. Can be moody, depressed, withdrawn. Can easily get stuck in a rut. Excessive attachment to status quo. Face: Round face; full cheeks, often dimpled. Soft, rounded features. Double chin, pug nose common. Large, moist eyes. Thick eyelids and eyelashes. Physique: Heavy frame, stout, with flesh ample and well-developed. Often pudgy, plump or overweight; obesity common. Joints dimpled, not prominent. Veins not prominent, but can be bluish and visible. Lax muscle tone common. Feet and ankles often puffy, swollen. Women tend to have large breasts. Weight gain especially in lower body. Hair: Light colored, blondish hair common. Light facial and body hair in men. Skin: Pale, pallid complexion; very fair. Soft, delicate, cool moist skin. Cool, clammy perspiration common, especially in hands and feet. Appetite: Slow but steady. Craves sweets, dairy products, starchy glutinous foods. Digestion: Slow but steady to sluggish. Gastric or digestive atony common. Sleepiness, drowsiness after meals common. Metabolism: Cold, wet and slow. Conserves energy, favors anabolic metabolism. Congestion, poor circulation, especially in veins and lymphatics. Kidneys slow, hypofunctioning, inefficient. Adrenals and thyroid tend towards hypofunction; basal metabolic rate low. Metabolic Water drowning out metabolic Fire. Predispositions: Phlegm congestion. Water retention, edema. Lymphatic congestion, obstruction. Poor veinous circulation. Gastric atony, slow digestion. Hypothyroid, myxedema. Adrenal hypofunction. Weight gain, obesity. Frequent colds and flu. Chronic respiratory conditions, congestion. Swollen legs, ankles, feet. Cellulite. Poor tone of skin, muscles, fascia. Urine: Tends to be clear/pale and thick. Tends to be scanty in volume, with excess fluid accumulation in the body. Stool: Well-formed, but tends to be slightly loose, soft. Bowels tend to be sluggish. Sweat: Cool, clammy sweat common, especially on hands and feet. Sweating can be easy and profuse, especially with kidney hypofunction. Sensitive to cold weather; suffers greatly in winter. Sleep: Very deep and sound. Tends towards excessive sleep, somnolence. Snoring common; can be loud or excessive. Dreams: Generally very languid, placid. Water and aquatic themes common. Mind: Tends to be dull, foggy, slow. Slow to learn, but once learned, excellent and long retention. Patient, devoted, faithful. Faculty of Empathy well-developed. Sentimental, subjective thinking. A calm, good-natured, benevolent mental outlook. Personality: Good natured, benevolent, kind. Nurturing, compassionate, sympathetic, charitable. Great faith, patience, devotion; tends to be religious, spiritual. Sensitive, sentimental, emotional, empathetic. Passive, slow, sluggish; averse to exertion or exercise. Calm, relaxed, takes life easy. Excessive sluggishness, torpor can lead to depression.